Dell Refurbished: Motherboard Planer Card (E6320)A motherboard ties all the devices in a system together. It connects the CPU, RAM, hard drives, CD/DVD drives, PCI cards and graphics card, while transmitting power to these devices. It also manages the data sent between the CPU, RAM, Hard Drive and Graphics Card. It is important that you correctly identify the motherboard your system needs. We strongly recommend that you use the Service Tag lookup feature in the Parts For Your Dell™ tool. This feature allows us to determine the model of the motherboard originally shipped with your system and supply a compatible part. If you have changed your motherboard or any part on it, please call the Parts and Upgrades Queue to verify you are buying the right part. In addition, it is important to know what additional features a motherboard can provide. Some motherboards come with Audio and Video capabilities and/or Network Interface controllers. These details are provided in the notes section of tech specs. Please note that this replacement product is refurbished. Dell provides a warranty of 90 days on all refurbished products. 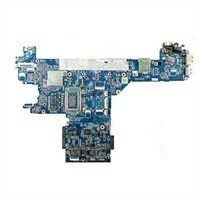 A motherboard ties all the devices in a system together. It connects the CPU, RAM, hard drives, CD/DVD drives, PCI cards and graphics card, while transmitting power to these devices. It also manages the data sent between the CPU, RAM, Hard Drive and Graphics Card.